2 more Attack Squadrons planned to patrol outer rim territories once 3 more planets are colonized. 2 Other Main fleets will be Expanded as required. 5 Imperial Garrisons on 11 Colonies each. After Expanding Southwards, the Empire met its first Alien contact. An insect-like sentient race who called themselves Acorea Hive(Gizzureans), The starting months of first contact itself went south as both Empires Expanded closer and closer. 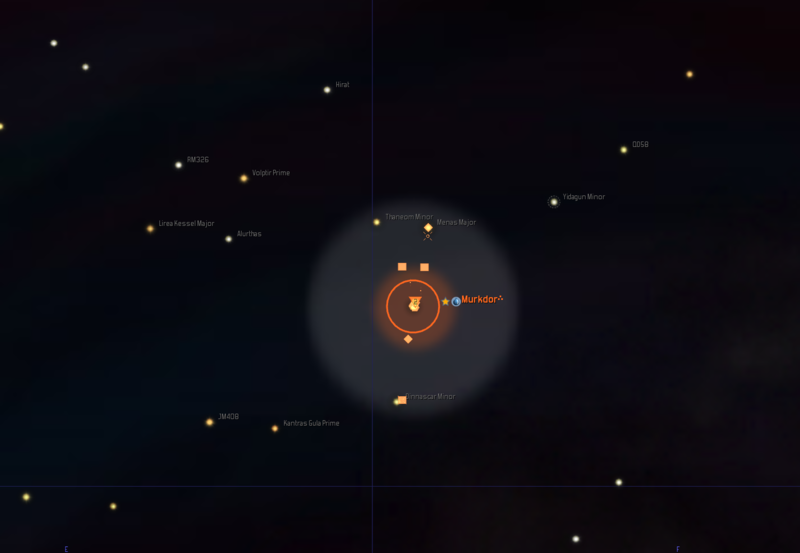 The Pssimbin System on the southernmost was a Hive colony. Empire Believed that colony was too close to the Terran Border and could easily be used as a staging ground for further attacks. The location of the planet also helped to protect the deeper planets as it was nearly impossible to attack the other systems without dealing with this. Hence it was decided, the planet Bespin in the Pssimbin System had to be taken. After setting up a forward resupply base just North of the Ancient Guardian homeworld. 1st Malasteri fleet reinforced by the 2nd Imperial Attack squadron was sent. Closely followed by the Imperial Sky Corps Transports with its Entire offensive force. 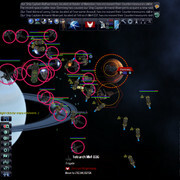 The Fleet landed Pismimbin System and made quick work of its defences, Thanks to active real-time enemy intel reports, All Counterattacks by Gizzureans were effectively countered by the Deep Core fleet and the Imperial 1st Attack Squadron(I was impressed that the AI effectively tried focusing on my resupply bases. If I had no active intel, this war might have gone another way due to me being outnumbered 3 to 1) Almost 60 ships destroyed, with 2 losses on my end. And with a quick successful invasion of Bespin. Soon The bugs asked for peace. And the First Acorean war was over. Two years after the first war, the Gizzueans declared war again. Their aim was to retake the Psmimbin System. They had managed to rebuild past their previous strength and started with an offensive in two locations. Again thanks to active Intel, Both fleets were routed. This was followed by Attacks and counter attacks on their staging areas. The ability of the bugs to rebuild their ships was astonishing. They managed to rebuild what they lost far faster than what I was capable of doing. Not to mention by fuel supplies were reducing rapidly from = 500k to 180k. We had to make a decisive Strike, something very very damaging. It was then I decided to strike deep in Gizzurean space in the Kestus System,It was one of the shipyards and a planet with 15Billion Gizzureans. 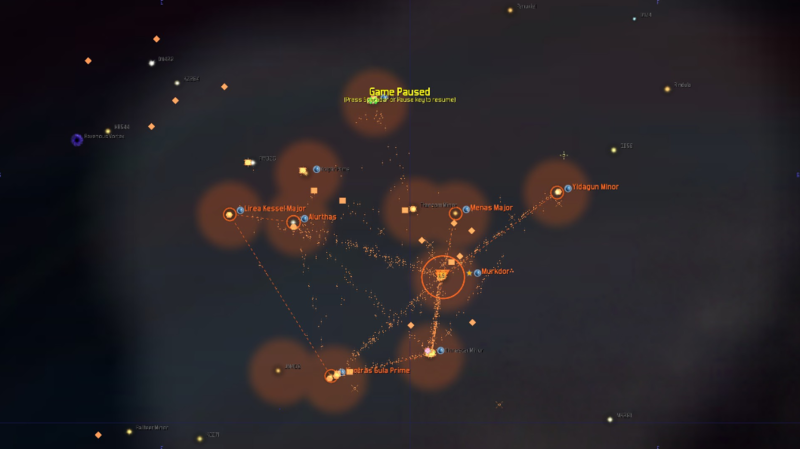 Again after Reinforcing the 1st Malestari fleet, they were sent, followed by the Imperial Sky Corps. Two Imperial Attack squadrons were sent to destroy resupply bases(Gas mining stations) which the Gizzureans used. The Fleet thanks to its Admiral, and especially its Alien Capital ship destroyed nearly 50+ ships in that system as wave after wave of Gizzurean ships kept jumping in. Then it was followed by the invasion, the invasion itself was quick. What followed was surprising. Gizzureans Rebelled, and wave after wave of them Attacked. Reducing their population from 15Billion to nearly 6 Billion. At least that was the information given to the public back home. In reality, the troops followed a scorched Earth policy were almost 2/3rd of the planet was wiped out. After Months of fighting on the planet, the Imperial Sky Corps had to begin emergency evacuation of troops. The planet, in the end, did manage to go back. Soon after the Gizzureans and the Empire came to a peace treaty. Status: offline Is this an AAR? Because there's a forum for that if it is. Definitely more like an AAR but having it here gets it more views. Your fleets look frigate heavy, I tend to build very few of them and no escorts. I just bombarded a planet with 3.4 billion denizens with a Combat Fleet that had 4 capitals, 3 carriers, 5 cruisers and 6 destroyers. Took a little over 6 months to wipe the planet clean. I put 1 frigate into my cruiser forces along with 2 cruisers and 2 destroyers for my planets defenses and a frigate each in my transport forces with a cruiser and a destroyer. 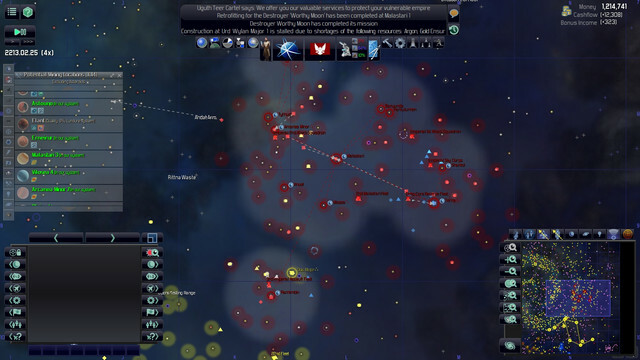 I make Assault Fleets with 3 capitals, 2 carriers, 4 cruisers, 5 destroyers and 4 transports. They carry 8 Infantry, 8 Armor and 8 Special Forces units for a mighty invasion punch. Status: offline Omnius and Lord-MM, can you post the main differences in weapons and other devices between your cruisers, destroyers and frigates ? Omnius and Lord-MM, can you post the main differences in weapons and other devices between your cruisers, destroyers and frigates ? All of my ships have Targeting and Evasion subsystems. My Frigates were focused around long-range lasers, with updated Engines and tactics set to long range. I sometimes put even 20 Engines on my Frigates, sometimes hilarious seeing these guys move around so quickly in the battlefield. While my Capital Ships and Cruisers were bit slower but Very Shield heavy with Blasters and Torpedoes. My idea was to let Capital ships and cruisers get in close with tactics set to Allout frontal assault, and their heavy regenerative shielding soak up the damage, while frigates hit from behind. The tactic helped quite a bit when Attacking Fortress worlds with spaceports and 4 defensive space stations. Status: offline a very interesting tactic indeed, I would like to try something similar in my next game. by the way, which command do you use to set the "Long Range" on your Frigates ? and also - generally speaking - why do you not use Missiles on your main ships instead of Torpedoes ? I always find Missiles (with no damage penalties over distance) far superior to Torpedoes. but maybe there is something that I do not fully understand here.. Presumably he set the engagement stances to Standoff or possibly Evade in the ship design screen. I'll note that Standoff and All Weapons are functionally identical when you only have one type of weapon on the ship, or when the weapons that you do have all have the same maximum range. Also, be aware that it appears as though engagement range is measured to a hostile vessel which is not necessarily the closest or most dangerous hostile, and that it appears as though a ship will not change its range reference unless something happens that makes its range reference invalid (the range reference is destroyed or captured, or jumps away from the engagement), so standoff is not necessarily reliable. As a warning, Evade is not particularly better, and as the stance can result in your ships remaining outside the range of their own weapons it's probably unsuitable for warships unless you're carefully managing your engagements. Torpedoes are essentially the jack-of-all-trades weapon within the game. Their high damage per shot gives them decent anti-armor performance over most of their engagement range and they have decent DPS at pretty much any range even if they're out-performed by blasters in close and by missiles standing off. Missiles, by contrast, are pretty much only good at standoff range while blasters cannot engage targets beyond mid range. a very interesting tactic indeed, I would like to try something similar in my next game. I use the standoff option on the ship design screen. Capital ships have blasters which have shorter range, hence I decided to use torpedoes along with it. I always believed Torpedoes have more damage(i could be wrong here). And I have noticed frigates with "Standoff" and strong sub-light Engines, try to just stay outside the range of enemy ships and fire their weapons. But maybe as Aeson said, the difference in tactics between my Frigates and Capital ships might be due to its components and design than the "stand off" setting. Status: offline Aeson, what do you mean for "decent DPS" referred to Torpedoes ? Aeson, what do you mean for "decent DPS" referred to Torpedoes ? A spreadsheet which might be of more service than an explanation in answering that question is attached as a *.zip file. Note that the DPS and DPS/size figures are theoretical maximum DPS and DPS/size at that range for that weapon and do not factor in DPS loss from missed shots or loss of size efficiency from mandatory supporting systems (reactors, fuel cells, etc). Also note that this spreadsheet is for the unmodded game; if you're playing with a mod that changes weapon damage, damage degredation, rate of fire, projectile speed, component size, etc, then the tables will not be accurate for your game. I use the standoff option on the ship design screen. Capital ships have blasters which have shorter range, hence I decided to use torpedoes along with it. I always believed Torpedoes have more damage(i could be wrong here). Depends on which torpedo and which missile you're comparing, but in general once you get out towards the maximum range of the weapon the missiles do more damage per shot. The torpedoes are much better than the missiles are if the target gets in close, though. Keep in mind that any target who's distance exceeds weapon speed / weapon rate of fire will have less DPS directed at it as the weapon will be ready to fire again before the projectile has hit and therefore will not fire until the first projectile has hit or missed. In essence, slower moving longer ranged weapons have a much much lower DPS than calculated on the sheet in almost all cases. If you look a bit more closely in the spreadsheet, you'll find that the Short Range and Long Range weapon pages have a second set of tables below the main one which computed the DPS numbers assuming the rate of fire was limited by projectile speed, because at the time I made the spreadsheet I wasn't sure if the game only allowed one projectile per weapon component at any given time and so computed theoretical maximum DPS numbers for both cases, assuming a 100% hit rate, and I haven't felt that inclined to go and update the spreadsheet to remove the extraneous tables. Status: offline This thread got derailed. Lets get back to the OP's intent if possible. I'm playing my first game in ages, but I am only tech 3 atm. As soon as I get a large enough empire I'll post what I made. I'd like to see what other players have accomplished. I'm just using the stock ship types made by the game, not bothering wasting time trying to Optimize ships, whatever that means. Will probably wait until I'm finished with research before I turn a resupply ship into a planet buster type ship as far as making a custom ship design. I just find frigates to be rather underpowered versus bigger ships and escorts are absolutely worthless. Status: offline I finished building almost 297 ships at one time and have them organized into fleets and forces. I have earned a "Evil" reputation just because I burned down one planet with over 3 billion in population. Keep singing Joan Jett's rendition of "Bad Reputation". So now going to work on reinforcing that bad reputation by burning down several planets in a short time against 2 empires. I'm playing the Kiadians with the Ways of the Ancients government type but am thinking next game it's time to play a bug race with the Ways of Darkness. I'm at war with the Dhayut race and I'm just going to burn down every one of their planets to completely eliminate them. No need for occupation forces. I've captured a planet from the Teekan Industries that had over 3 billion Kiadian denizens yet no Teekans, guess they invaded an independent colony instead of colonizing it. I'm going to destroy about 5 or 6 of their planets while I capture one more since it has a good ruins ability. Status: offline Well since I think the OP idea here was to have a kind of show off your empire thread, I'll play along as well. Just going to post 1 screen-shot of my ships. 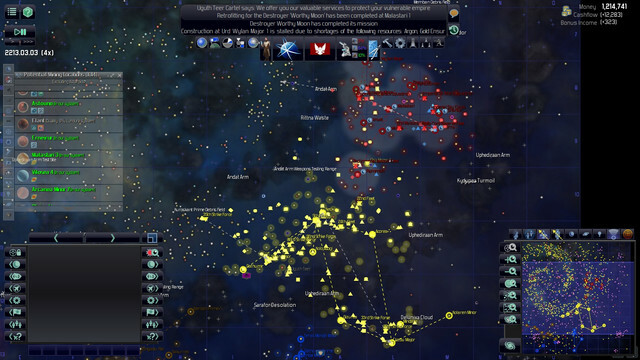 Bear in mind I play on a 1400 star map with 31 AI empires (I love mods). This shot is taken just after a certain story line event that most of us know has occurred, but I'll not spoil it for others. Lets just say its mid to late game. Oh, and I'm in 4th place currently. Status: offline Here are some stats from my current game as the Kiadian league. I just conquered the home planet of Atuuk who didn't colonize other planets. So funny they only had one infantry unit protecting their only world. They did have a lot of frigates sitting at home plus some cruisers and destroyers plus plenty of escorts around the solar system. I came in with one 18 ship Combat Fleet to attack the defensive base and to start attacking enemy ships. I delayed sending in my 18 ship Assault Fleet by a few days and a few days after that I sent in my 5 ship Transport Force with occupation infantry. I always move my fleets next to the circle of influence of an enemy planet before sending them in for the kill with some attack or bombard order. That way there's less time the AI has to detect the true target. I thought for a moment that I might have needed a second Combat Fleet but as I ran clock the assault fleet showed up and before I knew it I had my powerful troops on the ground with a more than 10 to one tactical advantage. I ended up picking up a lot of Atuuk ships that I ended up scrapping immediately. Here's my stats for my 51 colonies in 46 systems. I have built all the Wonders possible, except the ones that are race specific. My cash flow is over 8 million and my highest tax rate is 39%. I'm able to buy crash research programs easily, $960 K is chump change. These 873 ships are organized in 30 Combat Fleets, 8 Assault Fleets, 27 5 ship Cruiser Forces and 10 4 ship Transport Forces. I have less than 20 ships not in fleets, mainly for sand slug elimination. Their maintenance is 1,669 K. Their power # is 254 K. I have 269 Other State Ships including 31 Large Space Ports, 150 Defensive Bases and 34 Monitoring Stations. I love building monitoring stations near alien planetary areas to keep track of their ship movement. I have 1,430 Private Ships and Stations costing $733 K. I control all of my building of ships and planets plus mining stations to ensure I have an excellently functioning economy. I successfully ended my war with the Teekans by offering them $10K for peace which I knew they'd take since the value was only 103. I took over two of their planets while cleansing 5 others of their races. I've almost gotten the Dhayut race exterminated as I'm attacking their home system with two worlds and now one is clean while another small one has a Combat Fleet appearing over them right now. I used 4 Combat Fleets plus 1 Cruiser Force to eliminate the Dhayut in under three years. I cleansed around 8 worlds already and will soon have no more enemies. Then I can start picking on other races nearby, beat them up and end wars quickly before moving on to other races. I just pick on one or two at a time so I don't suffer war weariness. 1 system, no warp-drive, bacon mod. 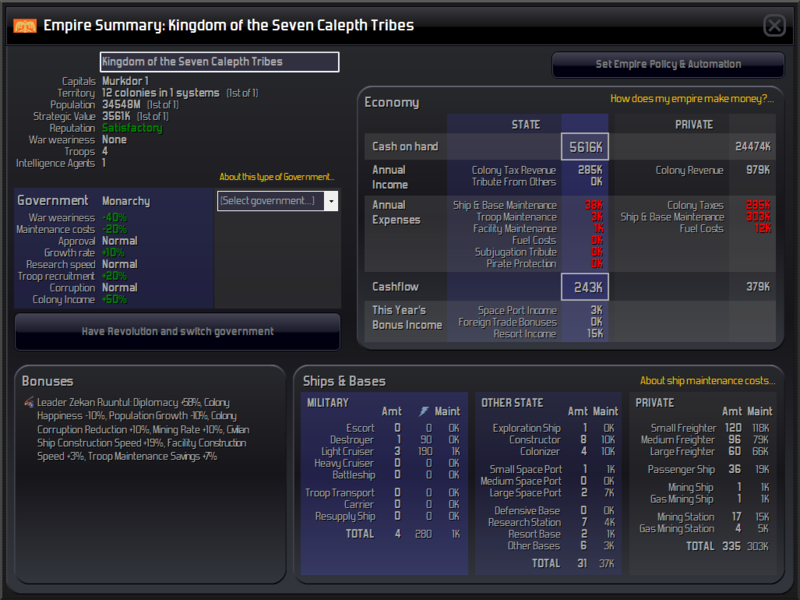 With nearly 35 billion souls and every bit of the system being mined, the Kingdom of the Seven Calepth Tribes are finally turning their attention outwards for interstellar colonisation. A concept prevously thought impossible without FTL-systems. While it at first was unclear how these colonies will sustain themselves with no trade from the home-system, advances in thrusters and fuel-storage has made this possible. Ships sent out decades ago has finally reached surrounding systems and reported back on the natural resources in the sector. 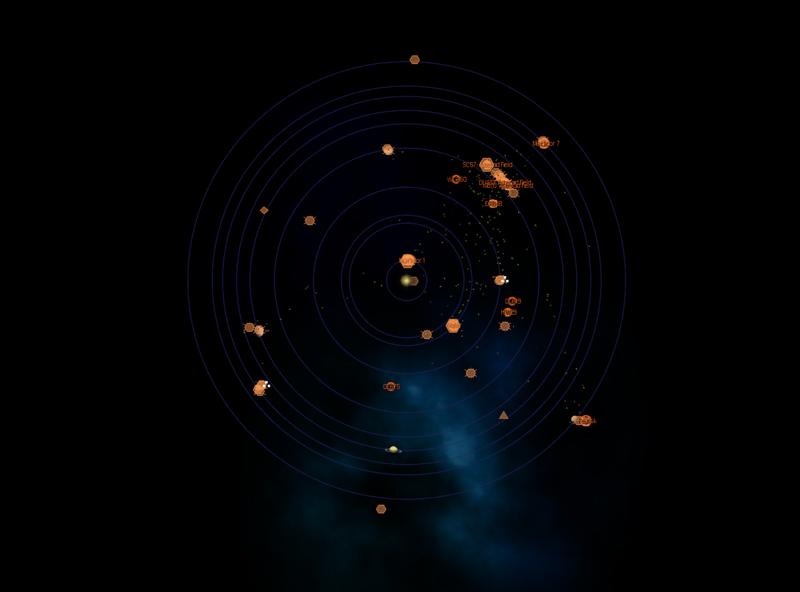 Might have gotten stuck in isolated rim systems with the 0.8 sector colonization enforcement. Way to go on the asteroid colonies. I'm glad to see them making a (small) profit. It's also nice to see the AI built all those freighters at only sub-light tech level. Don't forget to run prospecting missions with a science ship on those asteroid colonies to find resources that your exploration ships might have missed. Status: offline Sorry for the late reply. but it does look like an amazing concept. DUnno if ur still playing this game. But did u manage to colonize out of your system without warpdrive ? Status: offline Sorry for the late reply. Don't check the forum as often as I should. Was a really fun way to play the game. I did get a bit behind the other empires which had a much larger pool of resources to draw from. Might try at some point to make the warpdrive sublight speed to pull the AI down to my level at some point but alas. Sorry for the late reply. but it does look like an amazing concept. DUnno if ur still playing this game. But did u manage to colonize out of your system without warpdrive ? I did indeed! Got a bit unplayable due to the my planets being depleted of population to be sent to oblivion that is the asteroid colonies (see my video in the bacon mod thread to see what I mean). Though I had quite the lil' cosy empire by the end of it if I do say so myself.